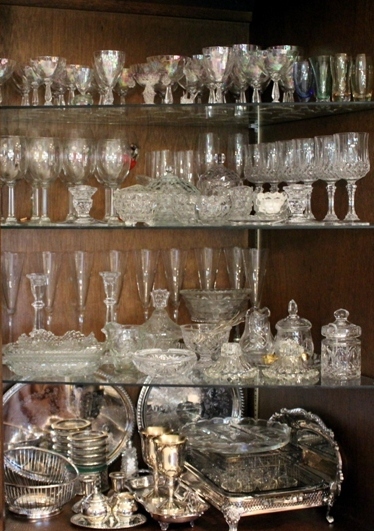 I have been collecting glassware for 50 years. 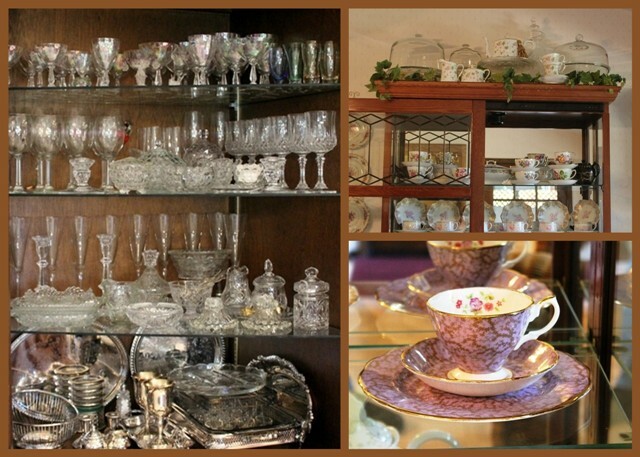 Wedding gifts, vintage glassware and silver from my 25th Wedding anniversary. 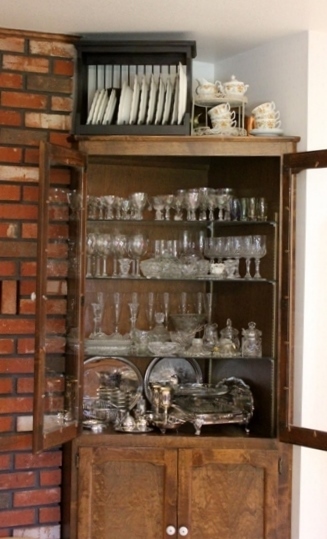 ﻿This cupboard was custom built in 1975 and it's in the corner of the dining room. The brick fireplace is in the center of the house. and the kitchen is to the right of the cupboard. 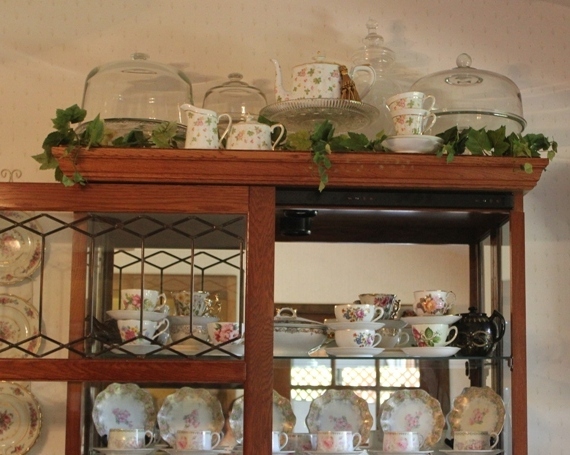 The cabinet is where my three piece tea sets are stored. 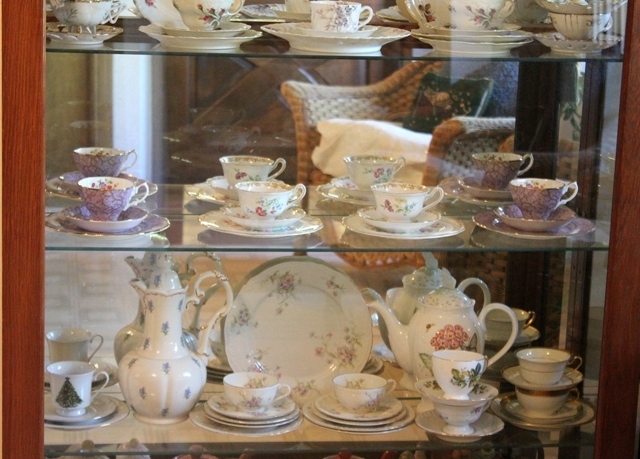 Also tea cups and saucers and the tea pots with matching sugar and creamer. Oh! It's such a joy to have beautiful dishes to admire everyday. 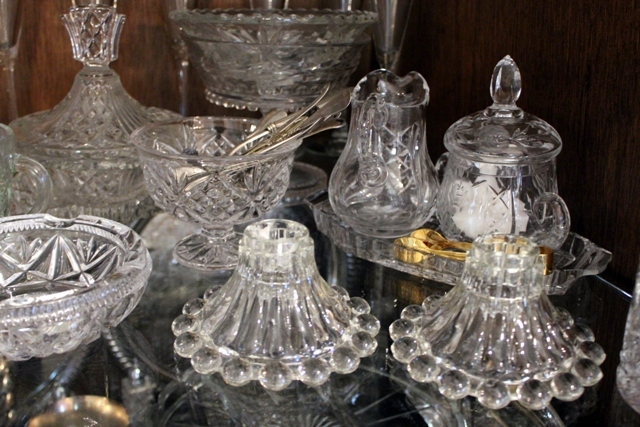 Beautiful crystal, silver and look at those tea cups!!! happy tea day! WOW! Betty I'm sooo jealous! What an awesome collection. 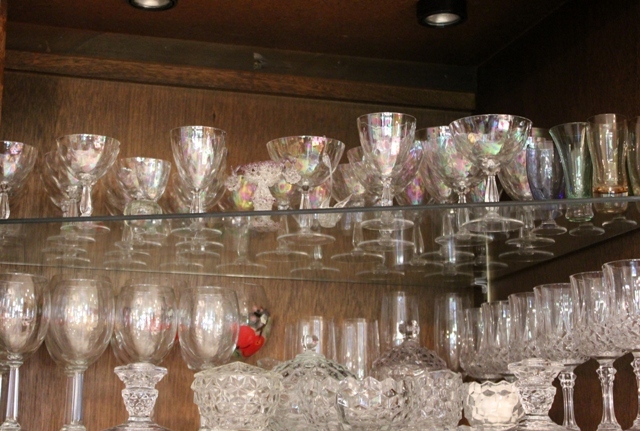 Oh my, Betty, what a spectacular collection you have! I love your Shell Pearl Fostoria collection! Anything that is iridescent, I love! 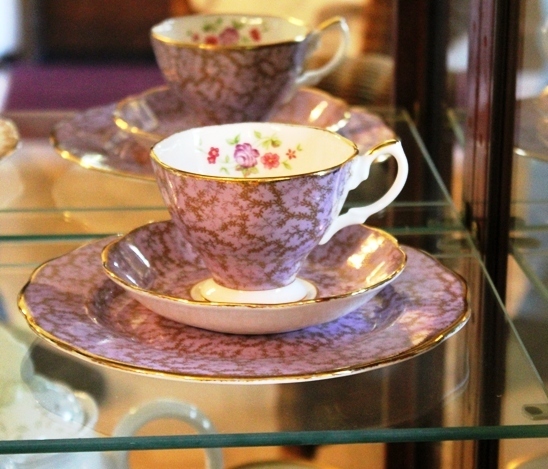 Love your pink teacups too! 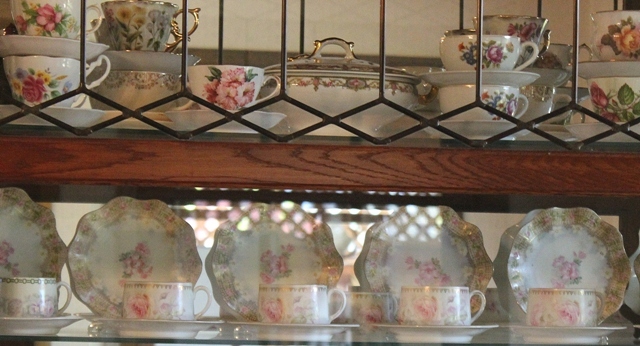 Lovely cabinets and dishes! Thank you for sharing and I appreciate you joining me for tea. It's a pleasure to have you! Hi Betty! Oh, I'm just having to wipe my tiny lips off as I'm drooling all over my computer looking at your cabinets! 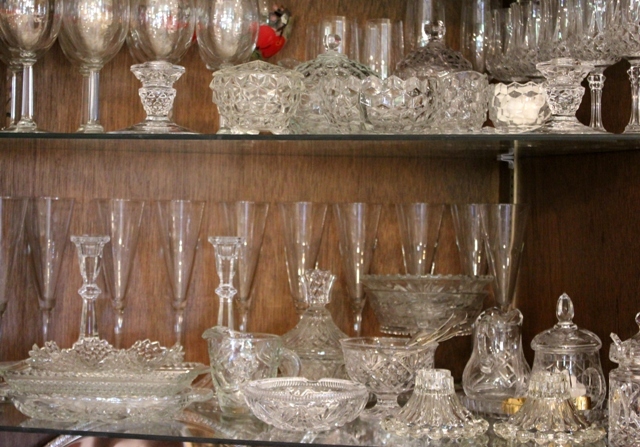 Look at all your beautiful beautiful glassware and china! Wow, you have lots! I love it. 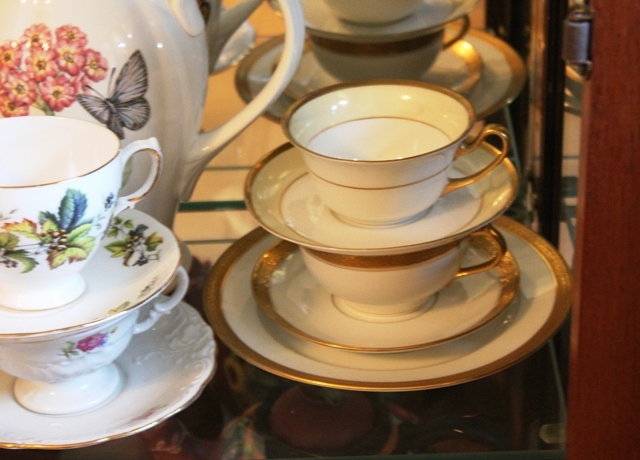 And the cabinet with your tea sets - I want one too! :) What pretty pieces you have. Thank you so much, Betty, for coming to my party. 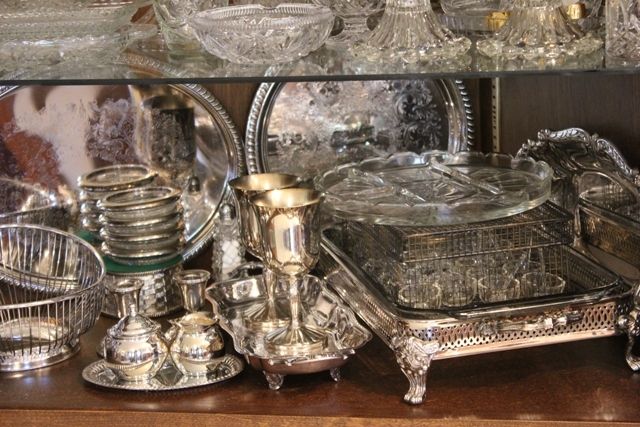 What a wonderful cabinet...I love your collection of glassware and I love silver too. Lovely! Just lovely! Your cabinets and collections are beautiful! !